A QUEST FOR SPEED. NOEL BADDOW POPE, 1909-1971. SURBITON’S FORGOTTEN RECORD BREAKER. …on 4 July 1939…he broke the Brooklands’ official motorcycle lap record for all time at a speed of 124.51 mph. Noel Baddow Pope was born in Toxteth, a sub-district of Liverpool, on Christmas Eve, 1909. He moved with his widowed mother to Surbiton before 1926 and died there in 1971. His second forename was the stage name of his father, who was a ventriloquist. As a schoolboy, Noel saw Lawrence of Arabia riding by on his Brough Superior motor cycle. Thus was born, in Noel’s own words, the germ of a lifetime’s devotion to the risks and thrills of motorcycling and racing. As a spectator at the famous Brooklands racing track, he was inspired by the great motorcycle racers of the time. After acquiring an electrical engineering diploma, between 1933-1939, Noel’s professional motorcycle racing career developed as he participated in meetings at Brooklands, the Isle of Man, elsewhere in the British Isles, and on the Continent. 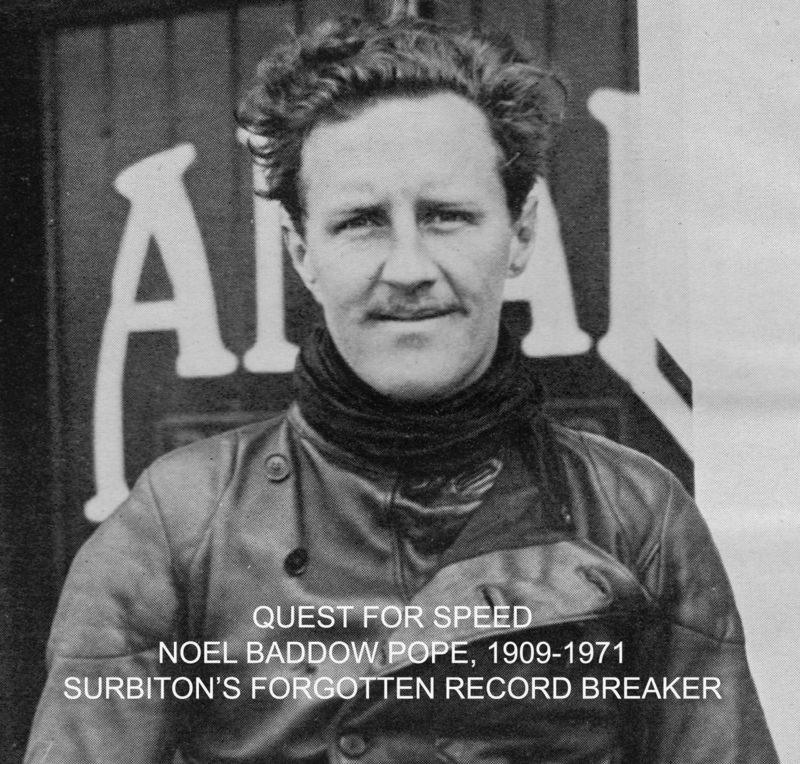 In 1938-1939 he gained many motorcycle speed records at Brooklands, including the fastest lap for solo machines at 124.51 mph on a supercharged Brough Superior: a record that stood for all time. He was an officer in the Royal Army Service Corps from 1939-1945, was evacuated from Dunkirk, served in North Africa, took part in D-Day and finished his war in Berlin very soon after the German surrender. In September 1949, on the Bonneville Salt Flats in Utah, supported in part by Comerfords, the motorcycle dealers of Thames Ditton, he made an unsuccessful attempt on the world land speed record on a streamlined version of essentially the same Brough Superior that he had used for the Brooklands record, ten years earlier. He crashed at about 150 mph and the attempt had to be abandoned. Thereafter, he wrote his autobiography, Full Chat, and engaged in many other pursuits. He was an active member of Kingston Sub-Aqua Club, was a writer of science fiction, he started a local newspaper, was the vice-president of an avante-garde art group and was president of the Kingston and District Motor Cycle Club. KINGSTON HILL PLACE: HISTORIC MANSION OF HANDSOME ELEVATION.